An Australian project that provides sanitary products and hygiene education for women in Sierra Leone has received a helping hand to get off the ground. LaunchPad is one of three innovative social change projects from the School for Social Entrepreneurs (SSE) that will share in $30,000 from the inaugural Macquarie Kick-Starter Grant pool. David Dixon and Chantelle Baxter – two Melbourne 26 year olds – are behind the LaunchPad project which aims to deliver affordable, eco-friendly sanitary pads to women and girls in Sierra Leone through a community of local female entrepreneurs. David and Chantelle developed LaunchPad after learning the majority of women in Sierra Leone don’t have a hygienic way of managing their period. Brenda asked Chantelle to buy her a packet of sanitary pads – the local nurse had told her she could get cancer if she didn’t use them. Sceptical, Chantelle returned to the hostel and did some research. The duo caught up with Brenda a few days later – she had taken the whole week off school due to her embarrassment at having her period. The unhygienic materials use to deal with periods lead to rashes, sores and bruising, and the women are regularly exposed to reproductive and urinary infections. “Women may use five pairs of underwear, kitchen sponges, old cloth and other makeshift materials to manage their menstruation,” Chantelle says. The funding will help LaunchPad get off the ground – however the project aims to be sustainable and not reliant on grants or funders to keep going. 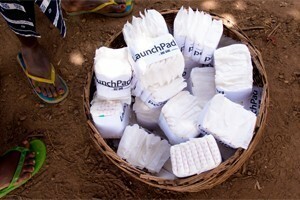 LaunchPad will sell the sanitary pads, rather than giving them away for free – LaunchPad’s survey of 500 women in Sierra Leone shows that they don’t find handouts empowering – they want to work with business. 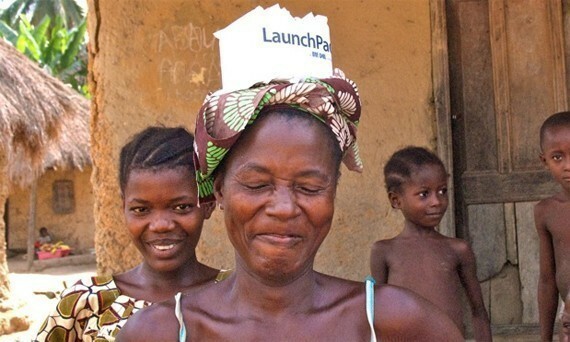 To reach 1.6 million women and girls across Sierra Leone, LaunchPad aims to empower local women to launch their own business selling sanitary pads. As well as selling sanitary pads, these ‘LaunchPad Champions’ will receive financial literacy and marketing training, conducts marketing and educational outreach in her community, and refer women with serious health issues to clinics. Above: Ena Harmon – One Girl Sierra Leone Country Director, Chantelle Baxter and David Dixon, meet with school children and their Principal in Sierra Leone. David says LaunchPad is initially targeting female leaders who are active in their communities to kick of LaunchPad, as well as brokering strong partnerships with established International Not for Profit organisations and using their networks to ensure sanitary pads are available around the country. Chantelle and David hope that by charging for their product they can ensure that LaunchPad will be sustainable, even when funding has dried up. “Receiving the grant means that Dave and I will be receiving a salary for the first time in two and a half years. This means we’ll be able to focus all our energy and time on getting LaunchPad up and running, and we’ll leverage the grant to access more funding and take LaunchPad from pilot to proof-of-concept.” says Chantelle. So what’s the next step for Launchpad? “Our next step? We’re shipping across 6 months worth of sanitary pads to 150 women in Sierra Leone. We’ve recently conducted our first LaunchPad Champion training program in collaboration with Marie stopes – our first 10 LaunchPad entrepreneurs are excited about receiving their first batch of sanitary pads. And we can’t wait to take this to the next level” says Chantelle.